We here at the Guesscipe book are always keen to keep recipes on the more authentic side, which is why we felt lucky to receive this recipe from our dear Italian friend. Alas, the fridge was not stocked as well as one might hope and the shop was far away, so we had to make a few adjustments. However, we’ll be writing the original recipe as given to us here. 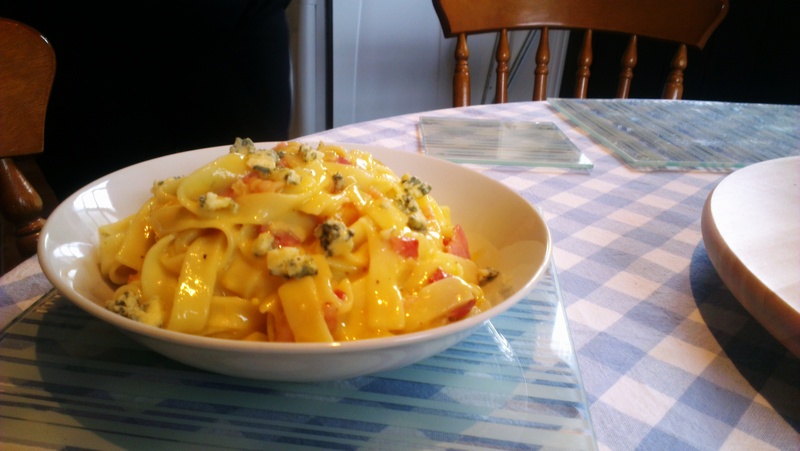 We were also a little naughty and added some Stilton as a garnish – sue us, Irene. This is an insanely easy and delicious thing to make – no longer than 20 minutes of work and oh, so filling! 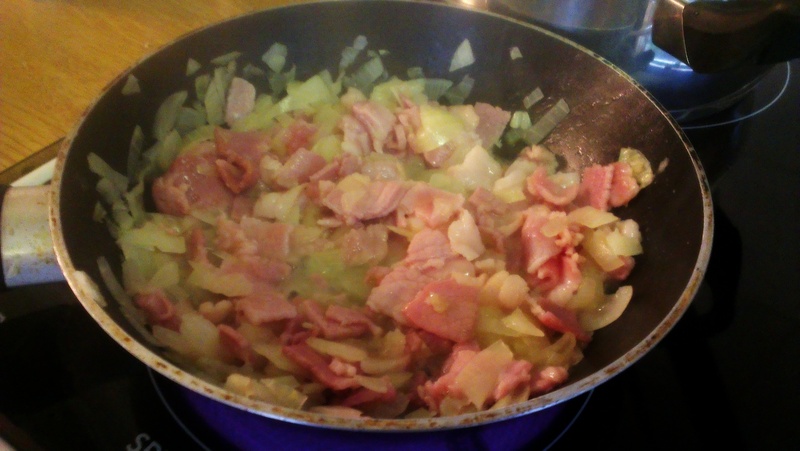 Fry the onion and pancetta in a non oiled frying pan. Add some of the pasta water if they start to stick. 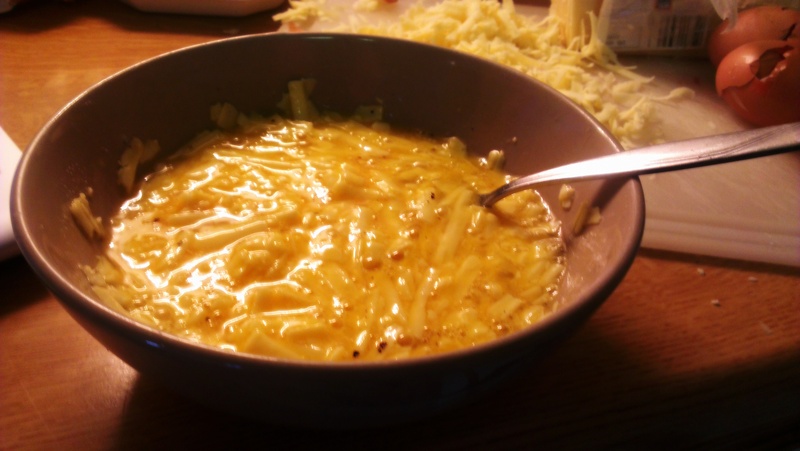 Meanwhile, in a bowl whisk the eggs thoroughly, then add in the cheese. Parmesan is best but we used Cheddar. So long as it’s strong. When the pasta is cooked, drain then return to the pan. Mix in the pancetta and bacon, then the sauce. Stir through thoroughly. 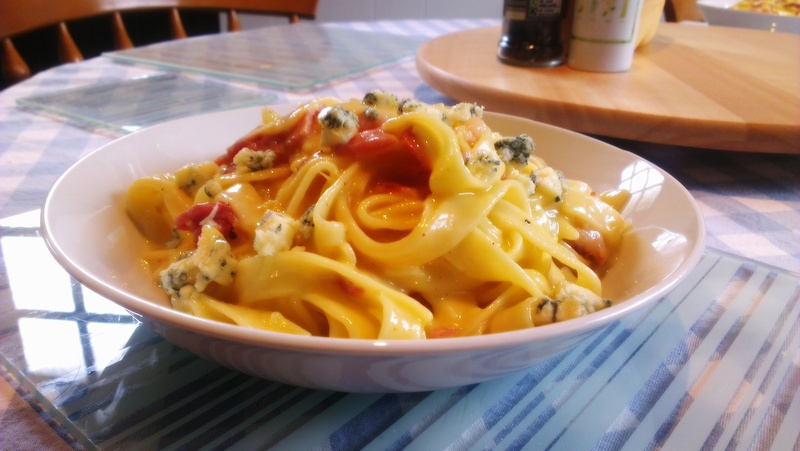 The eggs will cook and cheese melt in the heat of the pasta, giving you a lovely smooth sauce. Serve mixed (always serve pasta dishes mixed with the sauce!!) with a little cheese on top as a garnish. Again, preferably parmesan but other cheeses will suffice. Store in a sealed container in the fridge for 2 or 3 days. Reheat over a very gentle heat in the saucepan, stirring, to avoid scrambling the eggs. 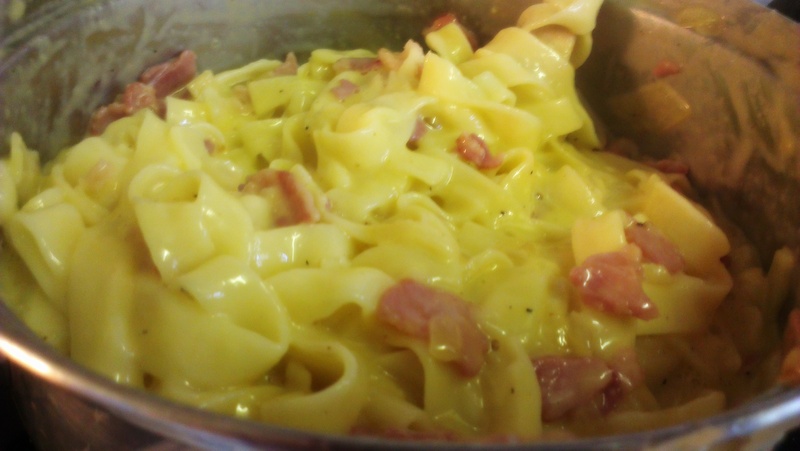 Posted in Guesscipes, MainsTagged carbonara, cheese, eggs, guesscipe, italian, pasta, recipe, spaghettiBookmark the permalink.